The images here are from an upcoming game about Pirates, Space Pirates! Eventually I began working with a Hungarian Artist on the Galaxy Pirates RPG project. Sketches and Artist’s renderings by Tamas Baranya, I asked Tomi if I could show some of the Work In Progress stuff to give people a behind the scenes view of the process and he agreed. 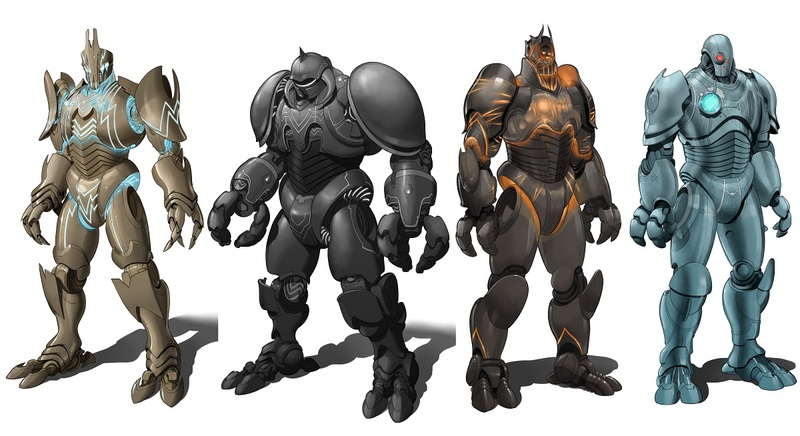 The pieces below are for the creatures part of the game, Sentient Robot enemies are going to be a big part of the game. 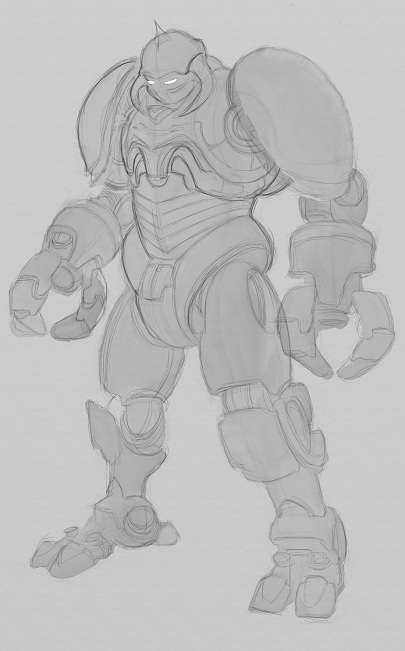 So we start off with a relatively simple Robot concept, its 12 feet tall strong and destructive, I call these robots the Destroyers. Initially Tomi gave me the sketch below. It’s a little bit Transformers and the head reminded me a little bit of the Giant Wrestling Robot from Futurama. The Wheel looking structures are supposed to be points of articulation and not places where the robot will transform into a Car or something. I asked Tomi to soften the head spikes a little bit and he did. This one almost looks too happy for a Death and Destruction robot. Especially something called a Destroyer, but we kept it anyway. 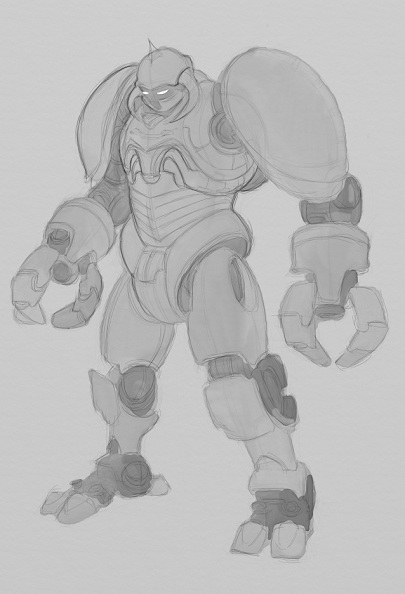 I worked on some other robots and creatures with Tomi before we came back to this series. I really wanted something that screamed Death, I remembered the old Frank Frazetta Death Dealer character and figured that couldn’t be mistaken for something else. So I asked Tomi for a little something more Frazetta. Well the Horns make it pretty unmistakable, the claws are a lot more robot and less gauntlet like, the rounded articulation in the joints is still there, but no wheels in the cheat that made the first one look like Bumblebee. 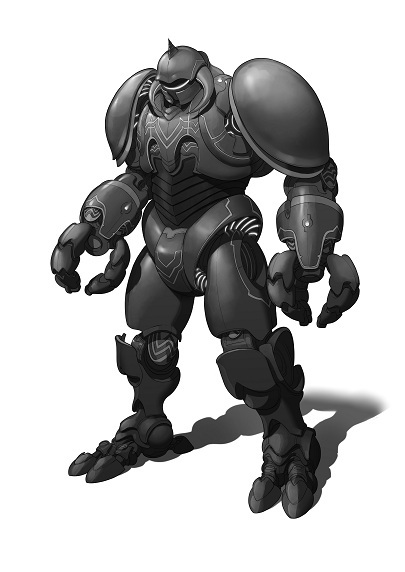 The legs however, just seem puny compared to the arms, and the shoulderpads are really almost cartoonish. I asked Tomi to make the legs longer and more proportional, and so it goes. 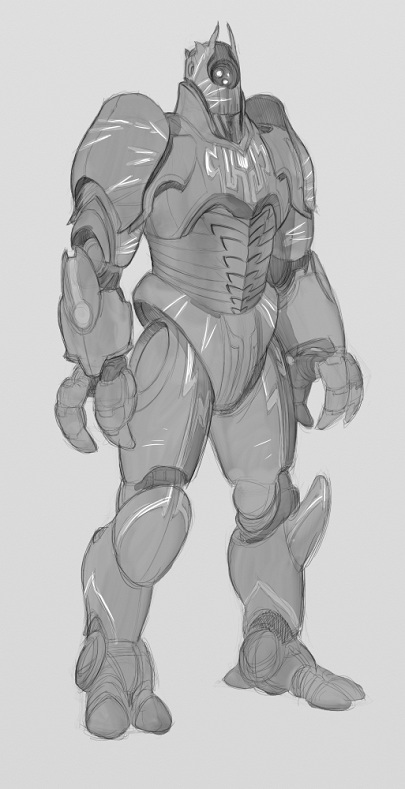 The legs are more proportional, the arms and claws are still a little oversized but that’s actually part of the design, the robot isn’t going to carry a giant battle axe and its supposed to shoot Death Rays out of the center of the claws, you should see the nozzles pretty clearly. So we run with the current setup and get the final image below. Okay so the robots want to destroy all Humanity, actually Organic life in general and the Death’s Head/Death Ray model pretty much sums it up, but I want variety, so I go back to Tomi and I ask him for something a little more primal. I ask for a robot with a raging fire in its heart, something that shoots plasma out of its claws and heat just radiates out of its armor and there’s an internal glow that just comes from the openings in its armor. I also told him to stick with the Chest Armor of the Death’s Head model so it would at least look a little like they came from the same place, to give us design elements that tied the different models together. This is the sketch I got back. The arms and Legs are in good proportion, the claws and shoulderpads aren’t oversized and it has a lot of the same design elements. Up to this point all of the Destroyers had been Black and White, Tomi tried to bring out the fire motif with the spark like highlights on the armor, but you couldn’t really do what we wanted to show the fire trying to shine through so we went color on this one. I think the heat coming through around the top of the shoulders and hips is probably the best expression of what I was going for. To a lesser extent the Elbow joints have the same feel, but the knees don’t have any of it. Looking back on it some inner glow inside of the claws might make sense as well. 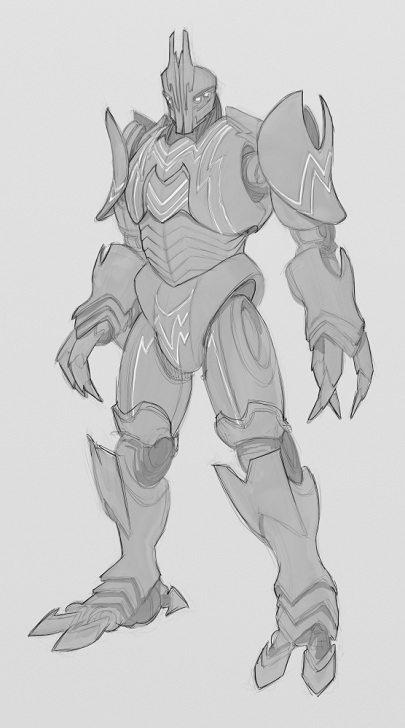 I was happy with it, I was trying to flesh out new concepts and so didn’t really know what to expect. Later on at Gen Con Jason Bulmahn was talking about the upcoming Mythic rules for Pathfinder and there was some kind of Fire/Lava creature that was surrounded by a cloud of volcanic ash as it walked, anyone approaching the creature would be choked by the ash and have trouble seeing. I’ve since looked into fantasy Fire/Lava creatures especially Kronos from Wrath of the Titans, a giant made entirely of lava. The lava seethes with an inner fire that’s really close to what I was looking for, but of course we want scifi so a hot iron kind of look most likely. At this point he biggest criticism of the Destroyers is some of them look like guys in suits of armor. This applies to the first 4, or First Generation or series of destroyers, we try really hard to fix that in Gen 2 as you will see. Anyways we go to to two more Destroyers in this series Electricity and Cold, I’m sticking with Elementals, this kind of reflects the roots of a lot of monsters in Role Playing games coming from Fantasy games where the elements and magic predominate. So Electricity has different Pauldrons, Kneepads and Facemask. It also has four eyes and two antenna making it a little different from the 3 Camera Lens arrangement of the Plasma Destroyer above. The detailing is reminiscent of Lightning Bolts and this destroyer is supposed to be faster on its feet than the previous 2-3 which were all lumbering brutes, this one is supposed to have more speed and it is thinner and the claw hands have seen their first real redesign and look a little like the first Destroyer we started out with. I approve the sketch and Tomi gives me something with finished lines. 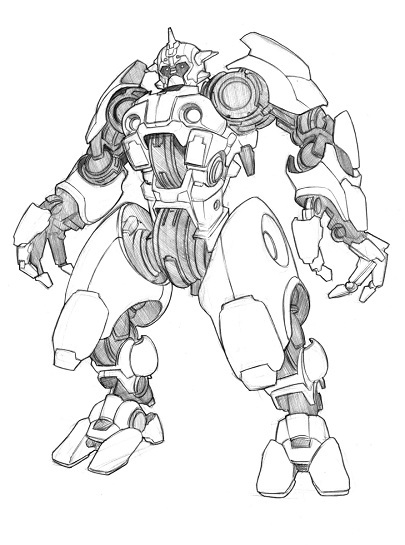 I approve that and we decide to go away from the harsh metal colors of the previous robots, this one again calls back to the first destroyer with an alloy kind of look. And some blue flourishes, I still wonder if we should have made all the pinstriping blue. The gold works for this model and I think stainless steel and blue would have not looked as nice. We did explore more blue with the cold model, I was kind of looking for a Batman Mr. Freeze look here, this was the first sketch. I really like the light white holes in the Pauldrons, it ties some of the design elements of the chest, hips and elbow joints together. 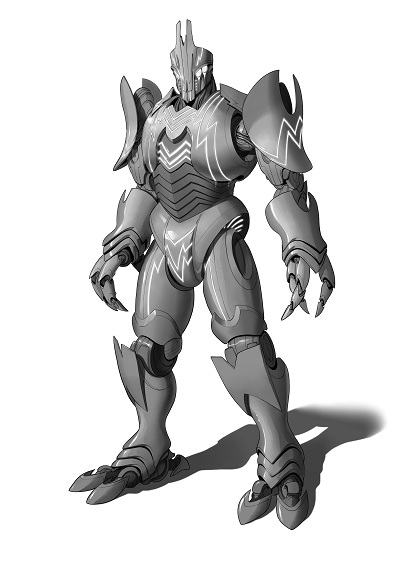 Facemask is different, Chestplate and Kneepads are mostly the same, the Claws return to the Brute model. Pauldrons are nicely differentiated as I mentioned but all the Destroyer design queues are still there. Unfortunately the Pauldrons, Hips and Elbow joints were all colored in AND approved by me before I really went back and decided how much I liked them in a different color as a design choice. We tried really hard to come up with some kind of icicle theme for the pinstriping that would imply cold, but it looks more like circuitry which might have been a better choice for the Electric Destroyer. All in all I like my Destroyers, I even tried them out on some of the geekiest Robot guys I know, the response from the Mekton Zeta Mailing List was largely positive though some folks couldn’t stand the Horned Helmet on the Death model. 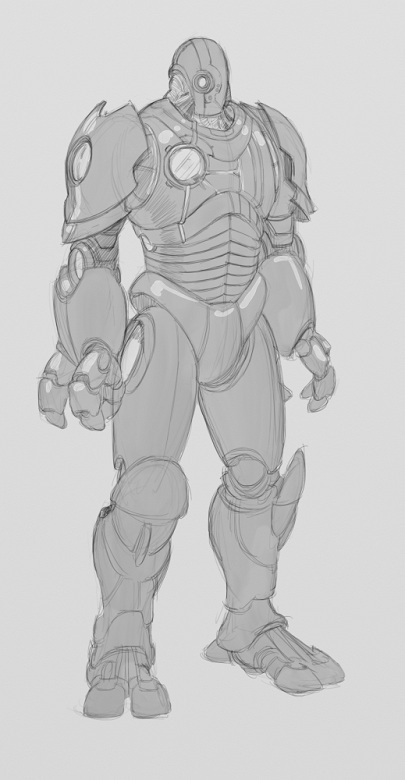 The feedback that they looked like guys in suits of armor persisted though and I needed to do something about that. So breakdown of the Robot Drawings, all of them had concepts in mind, none of them had a specific publishable project in mind. 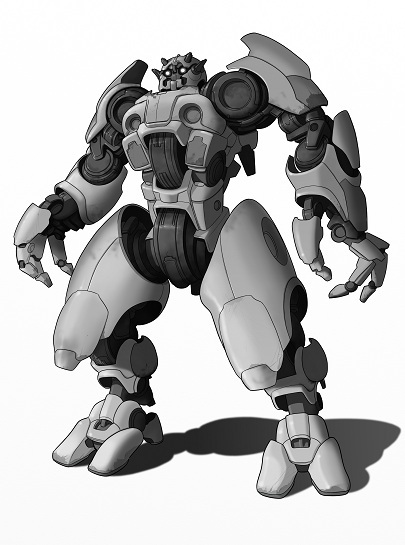 I have since decided that all of the Destroyers could go into a game supplement which could be used in Galaxy Pirates or by people playing Pathfinder as the robots are largely similar to Golems or Clockwork Constructs from fantasy as far as gameplay goes, and who couldn’t use 4 new constructs their players haven’t seen yet. -The final images were done in full color, a lot of the effects we used wouldn’t have come through in Black and White and we would have had to redesign the color scheme to make them work in B/W. For instance the Cold robot would have had obvious Icicle motifs, the Plasma one would have had obvious flames more at home on a Hot Rod than a monster, and the Electric model would have had more obvious lightning bolts and maybe some static electricity whirling around him. That is not to say it could not have been done, but we used color in a way that would be lost in grayscale, if you know upfront you are going to be going to print in black and white you must design accordingly. -Eventually I came up with a project, I could try to compare it to other monster supplements for pricing and sales information which means I might know how much money I might make back on it.